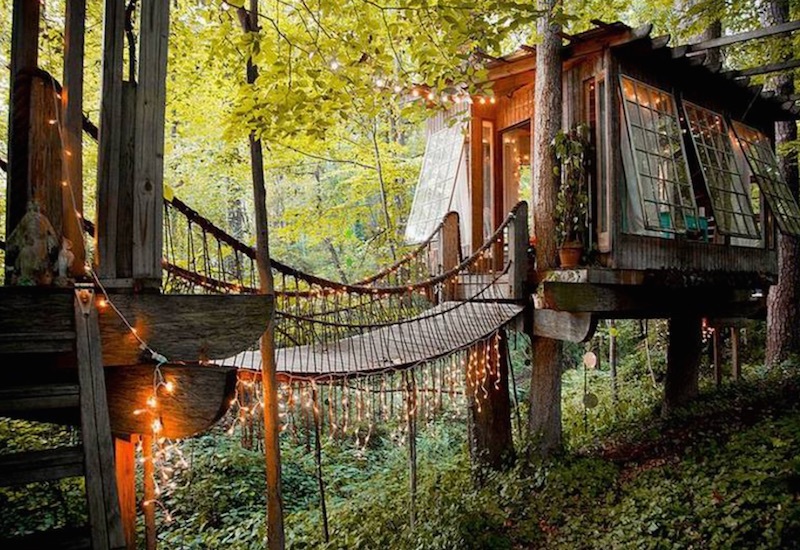 Maybe it’s the carefree, dreamy vibe we feel whenever we see pictures of treehouses — or our not-so-secret desire to purge all of our excess stuff and live minimally. Whatever the reason, these 12 treehouses will give you a major case of wanderlust — and the desire to live off the ground and among the birds. Found in diverse locations including tropical jungles, local rainforests, on the beach, and in a suburban backyard, these whimsical dwellings make living the treehouse life seem utterly appealing. The good news: several of them are available for you to book a visit, so if you need to scratch that airy living itch, you can… and still come back home with your feet on the ground. 1. This treehouse with a view is the perfect combo of playful (the suspended bridge), picturesque (the waterside view), and rustic (the wood paneling). The balcony/porch makes a great lookout for the ultimate game of hide and seek. 2. Is this what the homes of the future look like? We can’t say for sure, but while this spherical treehouse appears to come straight out of a sci-fi film, it’s actually one of three spheres located in a coastal rainforest on Vancouver Island. The extremely compact rounded shape makes these treehouses look like alien pods dangling in the forest. 3. Afraid of heights? This low treehouse is built just off the ground, achieving that airy feeling without making anyone hyperventilate. We’d love this as a backyard getaway — there’s even a simple chair for sitting back and sipping lemonade. 4. This treehouse is maybe a little ambitious for the home builder, but it showcases more than 20 years of work by a Tennessee minister. 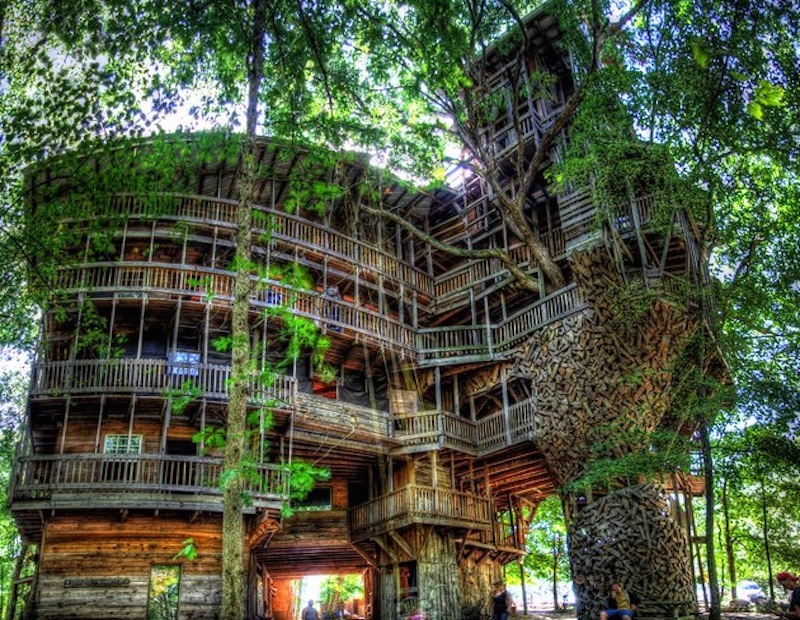 Currently closed due to safety concerns, this five-story, 100 foot tall abode (the world’s largest treehouse) is made solely from reclaimed wood. 5. This hobbit house takes the term “treehouse” quite literally. 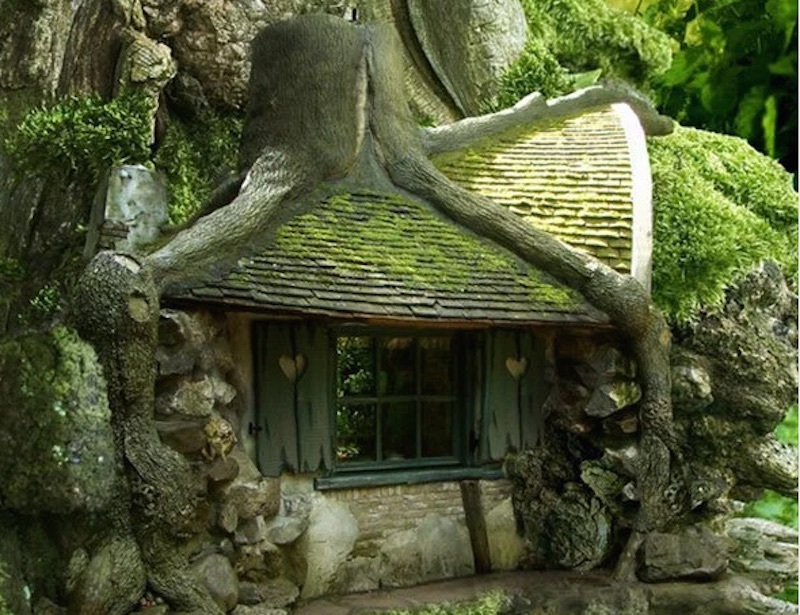 While no one can convince us that this isn’t located in Middle Earth, we’re amazed at the way that the tree and its roots are incorporated into the house’s design. 6. 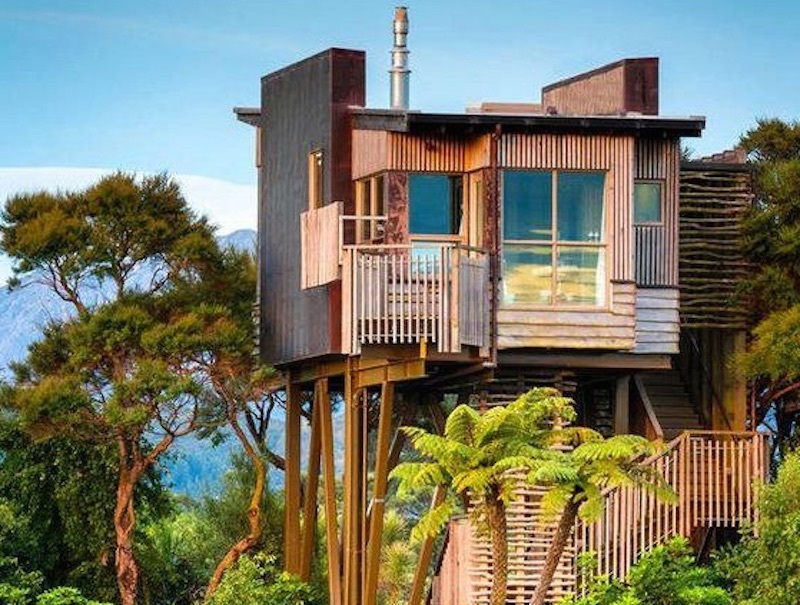 Treehouse design goes modern in this lush New Zealand landscape. You’ll be at impressive bird height if you stay in these treetop digs. We’d love to know what you can hear as well as see from up here! 7. The ingenious way that the treehouse wraps around the tree achieves a natural, organic look, as if woodland creatures crafted it by hand. Cozy, shingled and made from wood with stick supported handrails, this beehive treehouse blends beautifully into its surroundings. 8. 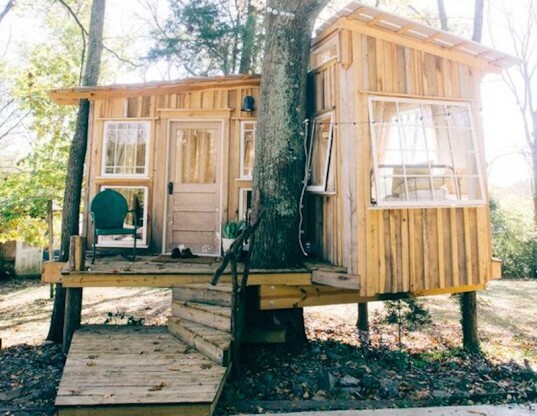 This is one of the most romantic treehouses we’ve seen — and it is surprisingly located in a family’s backyard in Atlanta. The bridge, which is festooned with magical twinkling lights, leads the way into an abode that has enviable and welcoming details including greenery by way of an entrance plant and windows that open out to let in all that fresh forest air. 9. What’s better than one treehouse? Two treehouses connected by a crazy wooden bridge! The main treehouse, much of which was made from salvaged and found materials, is only accessible through the smaller one and the bridge, imbuing a feeling of privacy as well as giving dwellers the sense of being a daredevil every time they make an entrance. 10. 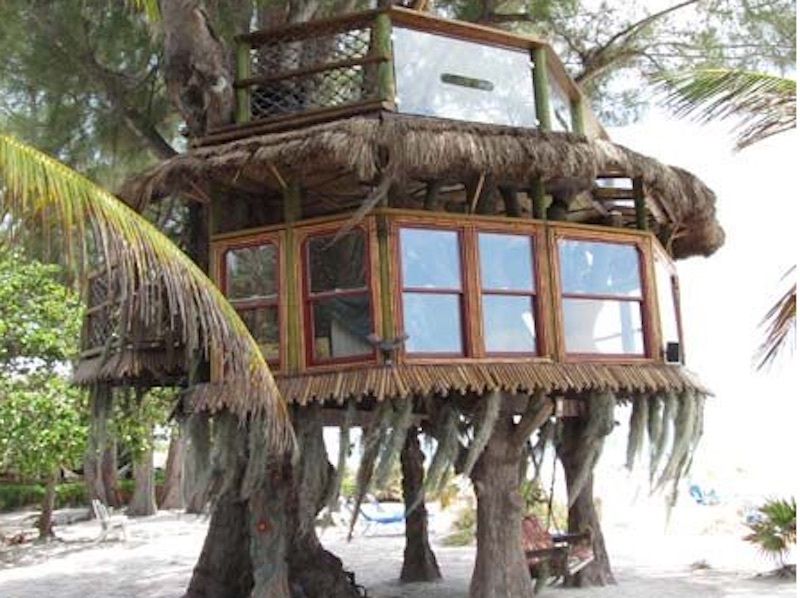 This treehouse looks like something Jack Sparrow might have dreamed up while the Black Pearl is in need of repairs. The wall of windows makes the small space (which was designed for relaxing, reading, and dining) look airy and light-filled. Soft sand is only a few feet down! 11. This awe-inspiring abode is located in Bali, hence the open-air island vibe. We would only stop lounging and napping to take a jaunt downstairs in time for meals on the swinging porch while lounging with pillows. 12. The lead image of this story and the image above is of La Piantata, a bed and breakfast treehouse located in the middle of a lavender farm in Italy between Tuscany and Rome. What dreams are made of! Maybe it's the carefree, dreamy vibe we feel whenever we see pictures of treehouses -- or our not-so-secret desire to purge all of our excess stuff and live minimally. Whatever the reason, these 12 treehouses will give you a major case of wanderlust -- and the desire to live off the ground and among the birds. Found in diverse locations including tropical jungles, local rainforests, on the beach, and in a suburban backyard, these whimsical dwellings make living the treehouse life seem utterly appealing. The good news: several of them are available for you to book a visit, so if you need to scratch that airy living itch, you can... and still come back home with your feet on the ground. 2. Is this what the homes of the future look like? 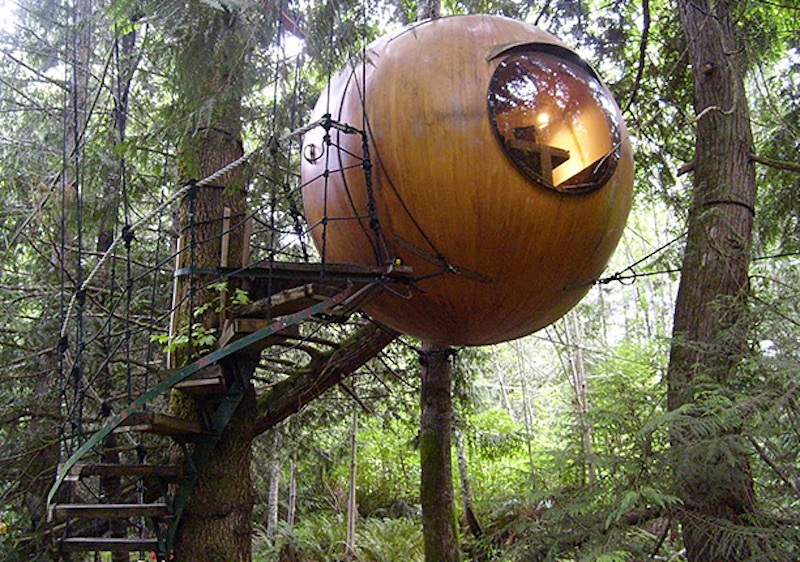 We can't say for sure, but while this spherical treehouse appears to come straight out of a sci-fi film, it's actually one of three spheres located in a coastal rainforest on Vancouver Island. The extremely compact rounded shape makes these treehouses look like alien pods dangling in the forest. 3. Afraid of heights? This low treehouse is built just off the ground, achieving that airy feeling without making anyone hyperventilate. 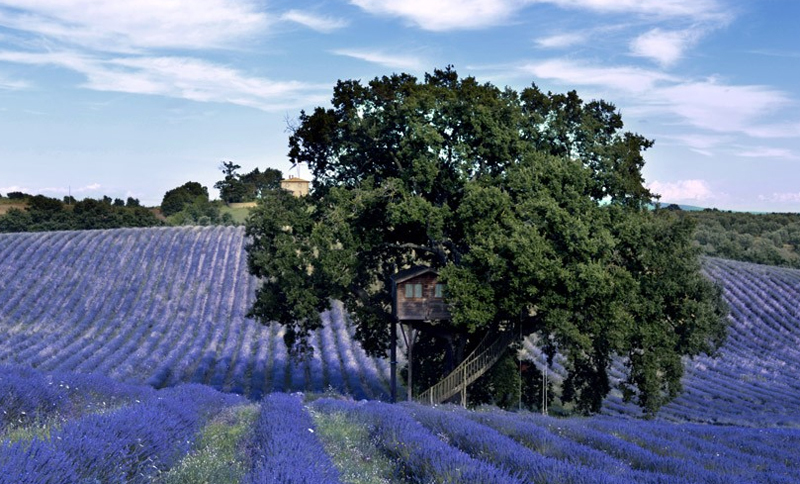 We'd love this as a backyard getaway -- there's even a simple chair for sitting back and sipping lemonade. 4. This treehouse is maybe a little ambitious for the home builder, but it showcases more than 20 years of work by a Tennessee minister. Currently closed due to safety concerns, this five-story, 100 foot tall abode (the world's largest treehouse) is made solely from reclaimed wood. 5. This hobbit house takes the term "treehouse" quite literally. While no one can convince us that this isn't located in Middle Earth, we're amazed at the way that the tree and its roots are incorporated into the house's design. 6. Treehouse design goes modern in this lush New Zealand landscape. 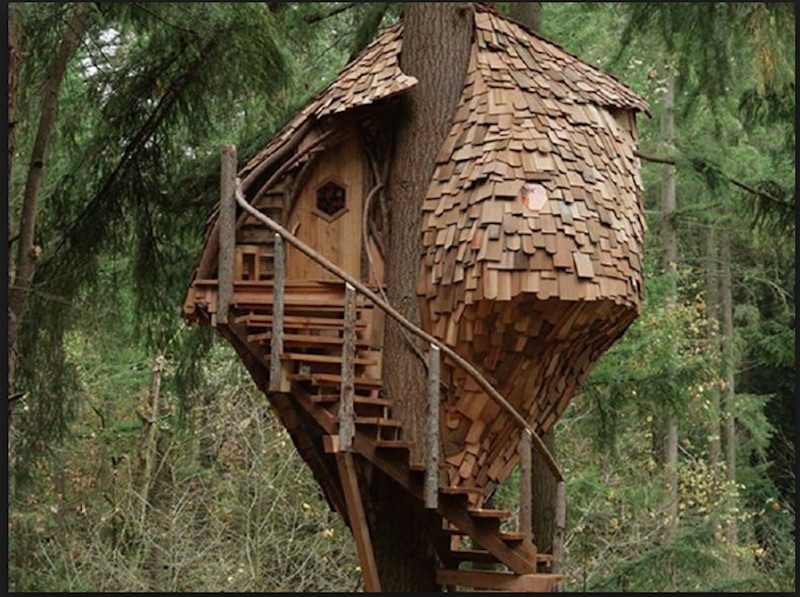 You'll be at impressive bird height if you stay in these treetop digs. We'd love to know what you can hear as well as see from up here! 8. This is one of the most romantic treehouses we've seen -- and it is surprisingly located in a family's backyard in Atlanta. The bridge, which is festooned with magical twinkling lights, leads the way into an abode that has enviable and welcoming details including greenery by way of an entrance plant and windows that open out to let in all that fresh forest air. 9. What's better than one treehouse? 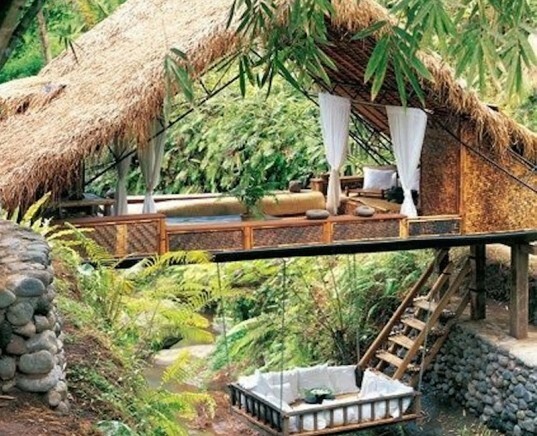 Two treehouses connected by a crazy wooden bridge! 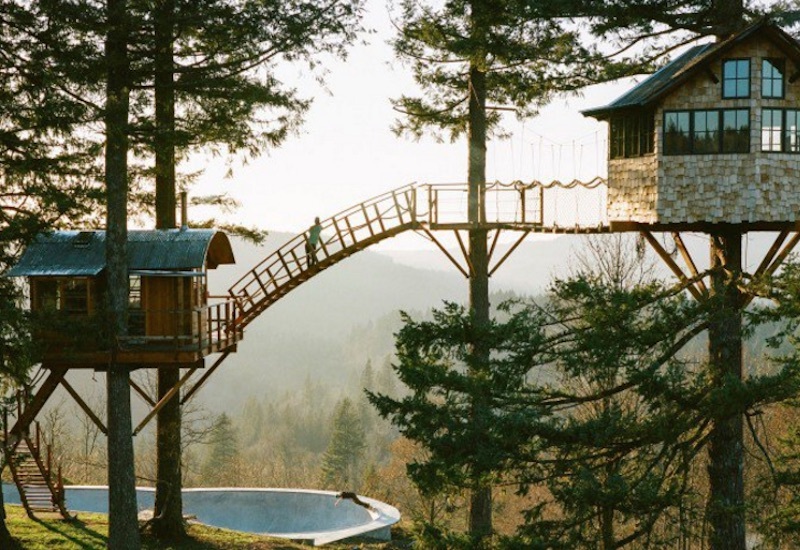 The main treehouse, much of which was made from salvaged and found materials, is only accessible through the smaller one and the bridge, imbuing a feeling of privacy as well as giving dwellers the sense of being a daredevil every time they make an entrance. 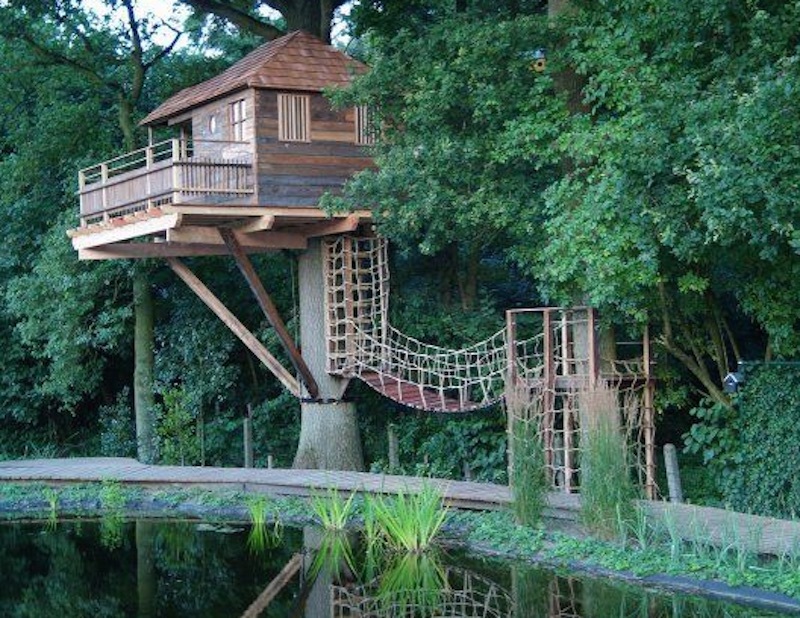 These treehouses make us want to get away from it all in the treetops.